My first trip is a “girlfriend trip” to honor a dear friend, Jane Schloemer Noebel, who passed away earlier this year. The high school gang of 12 will be meeting in Bend, Oregon to spend the weekend bonding and sharing memories of Jane. We plan to float down a river in tubes, eat at a Zydeco restaurant, relax in a spa, sit around a fire pit, and even have cocktails at a country club. So, how does one fit that attire into a carry-on bag? Luckily I have been collecting ideas regarding “packing” on my travel bulletin board on my Pinterest page, www.pinterest.com/robinleev so I know the best way to pack a carry-on is to roll items instead of folding them. Packing one pair of shoes, and wearing your 2nd pair is the only way to go. Sticking to a color scheme helps. 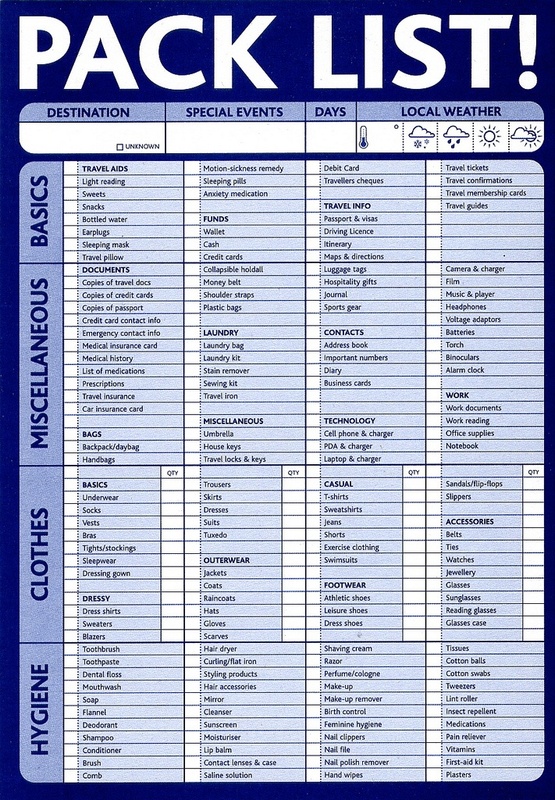 I also know a packing list can be handy so as not to forget crucial items, so I use this one. We have been asked to bring some photos of Jane. Here are the ones I’m bringing. The black and white one is from high school at Corona Del Mar High. Jane was Homecoming Princess. The second shot is from my bachelorette party in 1984. Jane was one of my bridesmaids. I like it because Jane was usually so conservative, but the other bridesmaids did her hair and make up that night before we all went to the disco in Palm Springs. It was the ’80’s after all! I don’t know if the Bend trip is over and done or if you are there now but if you are able… I hope you will share my love with all those girlfriends from high school. Jane was special, to be sure, and reading of her passing here has made me remember many wonderful things about her and my years at CdM HS. We tried to contact you, but were unable. Shoot me your email. The trip was about a week ago and it was like old times . Sally posted some photos of you and us on Flicker. Nancy McNamara isn’t doing well either (I can explain in email) so let’s keep in touch. I would love to hear from you and see the photos! I have one of Jane, you and I that you would love but I am not ‘tech-savvy’ enough to figure out how to attach it here…. After we got there, I’m not sure we actually had the nerve to survey anyone- did we, Robin? You were always the best talker in the group…. The real triumph was getting Jane to go along with any of the wild scenes Robin or I could dream up!